ORATORIO (AUS) (Bay 2001-Stud 2005). 4 wins-3 at 2, MVRC CS Hayes S., Gr.3. 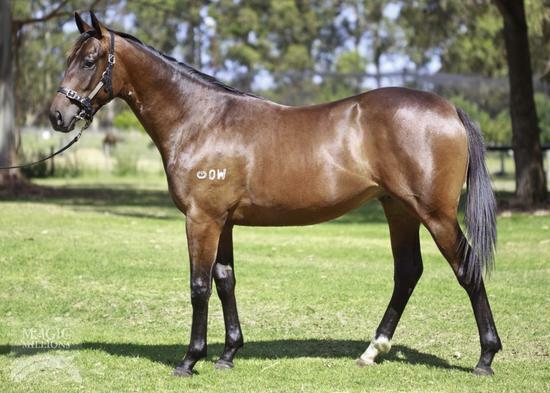 Sire of 399 rnrs, 240 wnrs, 15 SW, inc. Lucky Street (WATC Karrakatta P., Gr.2), Motion Pictures, Clueless Angel, Gold Rocks, Waratah's Secret, Private Dancer, Gold Busker, Rafaello, Cadenza, Mr Motown, Palace Intruder, Belora, Like an Eagle, Latoria, Trustee Brown, SP Dancing Express, Outlaw Pete, Moet Me, Shades of Rio, Passion Cantata, Colourful Charade, Indigo Ora, etc. Indigo Ora (f. by Oratorio). 2 wins at 2000m, 3d WATC Natasha S., L, Perth Racing Instagram P.
Tango Ora (g. by Oratorio). 3 wins at 1000m, A$83,845, to 2018-19, WATC Tabtouch H., 2d WATC Tabtouch H., Seacorp H., Penfolds H.
Russell Road. 9 wins-3 at 2-to 1200m, A$263,713, WATC Westspeed 2YO P., Creating Opportunities H., Myer 2YO P., Pink Metalskin 2YO P., Cardinal Virtue Sprint H., Playeronline.com.au H., Mark Allday H., Safety Bay Bowling Club H., Tabtouch Supporting the Industry H., 2d WATC Twitter.com Perthracing H., 3d WATC Westspeed 3YO H., Margaret River Fresh H., 4th WATC Belmont Guineas, L.
Rising Sea. 3 wins-1 at 2-at 1200m, 1400m, A$82,600, to 2017-18, WATC Opening Day H., Flying Colours Restaurant 2YO P., 2d WATC James Boag's Premium H., 3d WATC Heineken H., Reddifund 2YO P., Hosemasters H.
Superlative Choice. 3 wins at 1500m, 1800m to 2018-19 in Macau. GREY MAN (Family of Man). 13 wins to 1200m, A$249,850, VATC Christmas H., L, VRC Schweppes 1200 H., TROA H., Members H., VATC Household Financial Services H., Hawksburn H., Din San Nurseries H., 2d VATC GJ Coles S.H., Gr.3, VRC Carnival Welter H., Schweppes Welter H., MVRC Glenara H., VATC VAFA Welter H., Kallista H., GT Donoghue H., 3d VATC Chirnside S., Gr.2, VRC Standish H., Gr.3, No 13 Darwin Squadron H., MVRC Tweedside H., VATC Galway Highweight H., Foodtown Members P. H. Sire. TOLO HARBOUR (Success Express). 10 wins-3 at 2-from 1000m to 1650m, A$268,340, VRC Dalgety Bloodstock S.H., L, Myer Fashion S., L, WATC Colonel Reeves S., L, Queen's Birthday Welter H., Quality Sprint S., Fruit 'N' Veg H., Budget Rent-A-Car H., 2d WATC Winterbottom S., Gr.2, VRC Gallantic H., L, WATC Ascot Gold Cup, L, Goodwood Sprint H., L, VATC JD MacDonald S., L, WATC Directors' H., Maniana Quality Sprint H., West Australian Turf Club Welter H., Club Champion P Mann Welter H., November Flying H., Moet & Chandon Welter H., VRC Blazer Menswear H., VATC Durham H., 3d WATC Darlot Quality Sprint H., Honeydew Welter H., Chinese Chamber Cup Welter H., Au Fait H., Colgan Welter H., Qantas Frequent Flyer Welter H.
Man of Mahal (Family of Man). 3 wins at 1650m, 1800m, WATC John Johnson H., Gold Casket H., Camperdown H., 2d WATC Imperial S., L, Tattersall's Cup, L, Rentokil Pest Control H., Gay Treat H., 3d WATC Premier's Cup, L, 4th WATC CB Cox S., Gr.2. MR ARMSTRONG (Dylan Thomas). 9 wins from 1200m to 2000m, 459,529Rgt., S$225,051 in Malaysia and Singapore, Penang Sprint Trophy, L, Penang TC William Inglis & Son Trophy, Singapore TC Kranji C S., Big Maverick S., Class 3 H., Class 4 H., 2d Singapore TC Kranji C S., Flax S., Class 4 H., 3d Selangor TC Piala Emas Sultan Selangor, L, Selangor Gold Cup, L, Singapore TC Mount Faber Park S., Novice P., Class 4 H., 4th Penang TC Yang di Pertua Negeri Gold Cup, L, Selangor TC Tunku Gold Cup, L.